Lawrence Eugene “Larry” Knoche, 89, of the Kensington in Fort Madison, Iowa, formerly of Nauvoo, Illinois, passed away at 2:25 p.m. Monday, September 3, 2018 at Fort Madison Community Hospital. Born on November 21, 1928, in Peoria, Illinois, the son of Fred Christ and Grace Elizabeth (Huddleston) Knoche. On February 19, 1951, he married Lois Mae Gerhardt at the Appanoose Faith Presbyterian Church in rural Niota, Illinois. She preceded him in death on August 19, 2015. Survivors include one son: Donald (Sheila) Knoche of Arcadia, Florida; one daughter: Barbara (Donald) Schafer of Nauvoo, Illinois; four grandchildren: Brad Schafer, Brenda Schafer, Katherine McGuigan and Donnie Knoche; nine great grandchildren: Walden, Owen and Alexander Schafer, Chloe and Adalyn Knoche, Tori McGuigan, Camden Knoche and Meghan and Michael McGuigan. Also surviving are several nieces, nephews, special Knoche cousins and special friend: Betty Mead. He was preceded in death by his parents, wife: Lois and one infant grandchild. Larry had an infectious laugh and smile and his ornery streak was known by all. When Larry was not teasing others, he was always willing to lend a hand if anyone needed it. Larry and Lois celebrated sixty-five years of marriage and their love for one another was well known. He was a devoted member of the Nauvoo First Presbyterian Church and served as Elder and Trustee. Larry was proud to be a member of the Nauvoo Fire Department for twenty-nine years and served as Trustee and Treasurer. 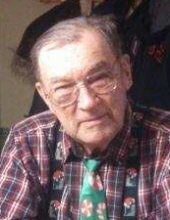 Larry also served on the Nauvoo-Colusa School Board and was a 4-H Leader. Larry attended Western Illinois University and began life as a dairy farmer in Peoria, before moving to Nauvoo where he farmed with his father-in-law Joyce Gerhardt. Larry loved growing flowers in his yard for passerbyers to enjoy. For many years he shared his love for woodworking with everyone and to this day, his works of art are treasured by many. He and Lois loved to travel, especially to visit their grandchildren. They square danced with the Circle Square Bs, were members of a local card club and Larry was an official “Charter” member of the Dottie’s Coffee Gang. He started the yearly tradition of the Knoche cousin reunion and loved spending time with them. Friends may call after 2:00 p.m. Thursday, September 6, 2018 at the Nauvoo Presbyterian Church in Nauvoo, Illinois where the family will receive friends from 5:00 to 7:00 p.m. that evening. A funeral service will be held at 10:00 a.m. Friday, September 7, 2018 at the Nauvoo Presbyterian Church with Pastor Mark Anderson officiating. Burial will be at Nauvoo City Cemetery. A memorial has been established in his memory to Nauvoo Fire and Rescue. To plant a tree in memory of Lawrence Eugene "Larry" Knoche, please visit our Tribute Store. "Email Address" would like to share the life celebration of Lawrence Eugene "Larry" Knoche. Click on the "link" to go to share a favorite memory or leave a condolence message for the family.